Sloane House Hotel, ca. 1890. 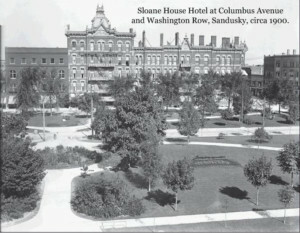 Image courtesy of Sandusky Library Archives Research Center. Note the horse drawn carriages. This is the second building to be built on this corner. 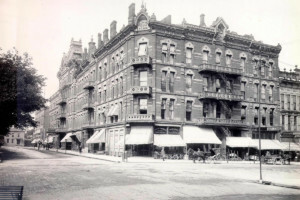 After relocating the Cooke home, Rush R. Sloane broke ground for a hotel on this corner called the Sloane House, which opened to the public on November 17, 1881. If you were standing here on that day, you would have seen an imposing structure that stretched 200 feet along West Washington Row and another 92 feet along Columbus Avenue, filling almost the entire block. The Sloane Ho use boasted having 125 “first class” guestrooms, a main dining room, and four parlors that were described by the Sandusky Daily Register as being “furnished throughout on a scale of unusual elegance and liberality.” The hotel’s main entrance was located on West Washington Row, where guests used a “grand spiral staircase” by the front desk to reach the upper floors. Rates for the hotel at its opening ranged between two and three dollars per night depending on the room selected. 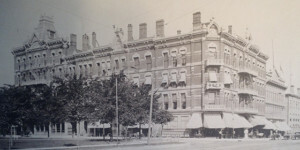 The Sloane House was demolished around 1948 and LaSalle’s built their store. January 3, 1872 – Dog Fight – About 10:00 Monday morning a couple of dogs engaged in a fight in front of Mr. Textor’s store on Columbus Ave. and during the melee they broke a large pane of glass in the store window. It took several hard taps from a policeman’s billy to separate the canines.